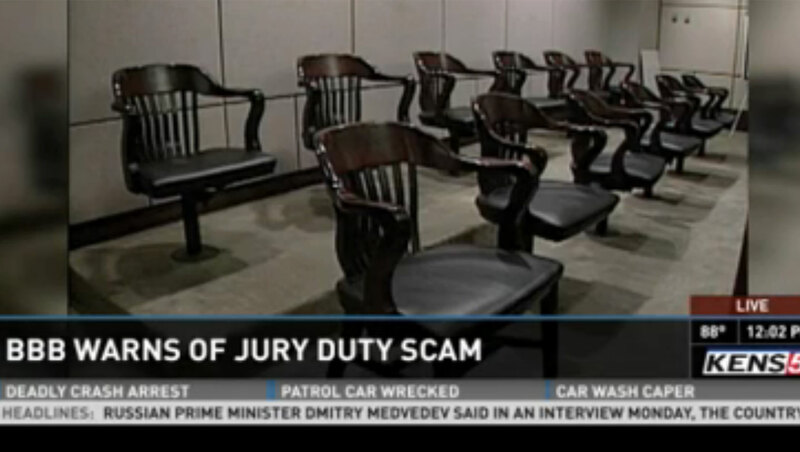 SAN ANTONIO -- Authorities in Texas are warning about a new scam -- con artists posing as court officials, telling people they missed jury duty, and saying they need to pay a fine. Takes your money by claiming you must either pay a fine with a reloadable debit card, such as a GreenDot MoneyPak, or be arrested. The Better Business Bureau (BBB) also warns that the scammers will commonly ask for confidential information such as your social security number and birthday for "verification purposes". However, the station says that real federal courts will never ask for sensitive information over the phone or by email. They always correspond through traditional mail. As further advice, the BBB says to never provide any account or other personal information for such phone calls. You should also never wire transfer money or purchase a green dot card without verifying who is on the other line. These payment forms are most commonly used in scams because they cannot be traced. Also, if you do feel you really may have missed jury duty, always call your area County Clerk's Office to verify if you have been summoned.